A large marine mammal sometimes called a sea cow. A manatee is a slow-moving aquatic mammal that falls under the taxonomical classification of the Sirenia. 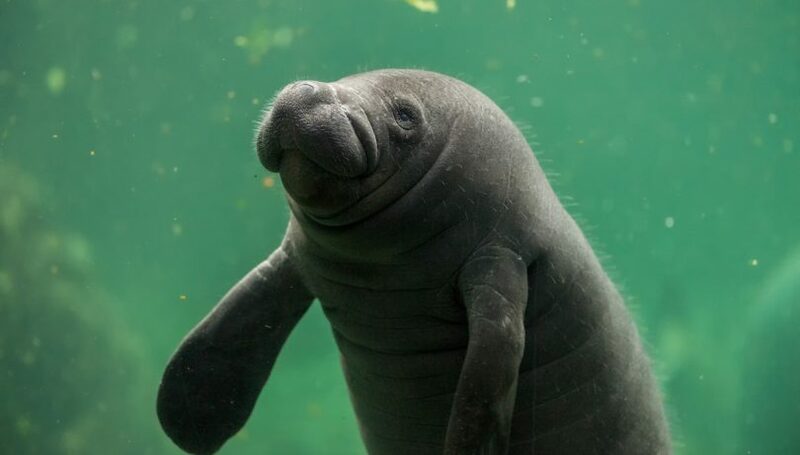 Of the four species in the order of the Sirenia, the Amazonian manatee, the West African manatee and the West Indian manatee are three; the last is their Pacific cousin, the dugong. They are characterized by a paddle-shaped tail which has seen them linked to the folklore surrounding mermaids. The predominantly herbivorous creatures can be found in the Caribbean Sea and the Gulf of Mexico. Manatee prefer shallow coastal areas as they are an air-breathing aquatic species. Manatees’ teeth regenerate throughout their entire life cycle, with new teeth developing at the rear of the mouth as older teeth fall out further forward. The world’s oldest known manatee has died in Florida at the age of 69. Snooty the manatee died in a “heart-breaking accident” after getting stuck in a maintenance hatch attached to his tank in the South Florida Museum. It is believed that he drowned after becoming trapped. In 1979, Snooty became the mascot of Manatee County. Manatees never leave the water but like other marine mammals they need to go to the surface to breathe air.